Time for another one of my lists (I know, you’ve been hardly able to wait!) – this time, the subject is movies. I’ve always been a big movie fan, but I really went nuts while in my late teens, in the mid to late 70s. Every afternoon, the PBS TV station out of Chicago, channel 11, would show selections from the Janus film collection, many of them foreign films. I quickly lost it all over these strangely beautiful concoctions with subtitles. I also began reading the critic Pauline Kael, first her books and then her columns in the New Yorker. From these I learned how to watch and “read” a movie. Finally, it helped that my Mom had grown up watching a lot of the American movies from the 1930s and 1940s that I was also becoming fascinated with – she had a great memory of trivia about these movies, and a very developed critical eye for what was good and what wasn’t (I remember her telling me, for example, that she normally couldn’t stand the actress Betty Hutton, but that she loved the daring comedy Miracle of Morgan’s Creek, and how funny Eddie Bracken was in it. I finally got a chance to see it a few years later, and it remains one of my favorites, and I think of my Mom every time I see it). I watched as many movies as I could, and learned the trick to watching movies from the thirties to the fifties (when the production code was in full force, strongly censoring and controlling what could and couldn’t be explicitly displayed on the screen) compared to the “modern” films of the sixties and seventies. I still love movies, but I don’t get out that often, and I rarely rent new movies. There are still many, many wonderful movies being made, and I eventually catch most of them on television, but for some reason I find it difficult to get excited about many of them, and still watch Turner Classic Movies more than any other channel. I think it’s because the technology and money and visual wizardry that is the norm these days seems to, more often than not, at least for me, come across as antiseptic and impersonal. It also seems that most movies made these days are calculated to appeal to a predefined demographic and as a result have become more and more formulaic. An example: a few years ago, the film Little Miss Sunshine – with a great cast featuring the great Alan Arkin, Greg Kinnear and Steve Carel – generated a lot of buzz as an alternative to the big budget blockbusters. I finally got around to watching it and found it thoroughly predictable and unimaginative – it stayed true to the formula of the independent, arty alternative film, and as such, was every bit as predictable as the latest Mission Impossible or Adam Sandler comedy vehicle. That’s not to say there aren’t still a lot of great, original movies being made these days (Moon and There Will Be Blood are two examples of brilliant film making in the past few years that come to mind). It’s just that for some reason, my passions are rarely stirred these days by a new film as they are by a repeat showing of a Truffaut or Fellini or John Ford film on TCM – but that’s just old and stodgy me. Anyway, I’ve compiled list after list of films in various categories, so I’ll start with the big one, the list of my all-time favorites. As always, it is the list as I think of it at the moment, and is subject to change as my mood or whimsy dictates. #12 Casablanca (1943) Directed by Michael Curtiz Arguably the greatest screenplay ever written (by Julius and Phillip Epstein and Howard Koch), this movie has given us such unforgettable lines as “Round up the usual suspects”, “we’ll always have Paris”, “here’s looking at you, kid”, and “Play it, Sam” (the exact line “play it again, Sam” is never spoken). 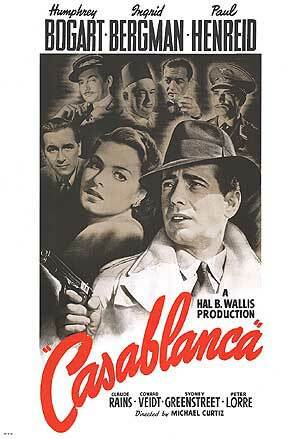 Bogart, Bergman and Claude Rains are all unforgettable. Probably the greatest love story ever filmed. 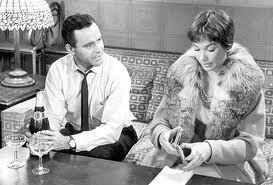 #11, The Apartment (1960) Directed by Billy Wilder The most cynical of all of Wilder’s masterpieces about cynicism (see Stalag 17 andSunset Boulevard), The Apartment is elevated by Jack Lemmon’s brilliant performance as the schmuck who rents his apartment out to his bosses for their sexual dalliances in return for promotion. Only Lemmon and Wilder could bring out the poignant pathos in this character – it is one of the great performances in the history of film. #10, Rushmore (1998) Directed by Wes Anderson Brilliantly off beat, this comedy about the king of a prep school who becomes friend and then romantic rival with a millionaire industrialist never goes in the direction you expect it to. In the process we are treated to the greatest performance by the great Bill Murray, in a movie that is every bit as eccentric as his comic persona. #9, Duck Soup (1933) Directed by Leo McCarey The greatest comedy ever made, and the crowning achievement of the great Marx brothers. Clocking in at just under 90 minutes, it opens on a high note, and never lets up. This time, Groucho (as Rufus T. Firefly) has been named president of the Republic of Fredonia. With the help of Chico and Harpo (who are the worst spies ever for the rival country of Sylvania) and the cinematic direction of McCarey, the brothers demolish government and wars and society. Highlights include the cabinet meeting, the musical number celebrating the upcoming war, and the justifiably famous mirror sequence. #7, The Third Man (1949) Directed by Carol Reed From a script by Graham Greene, The Third Man is about a naïve American author of paperback westerns (brilliantly played by Joseph Cotten) who goes to post World War II Vienna to look up his childhood friend, the mysterious Harry Lime (played by Orson Welles), who may or may not be dead. As Cotton blunders his way through an investigation, he learns that Lime has become the personification of evil, trading penicillin on the black market. Tremendously atmospheric and suspenseful, with a great final shot where Cotton is rejected by the woman he has fallen in love with (Allida Valli). #6, The Maltese Falcon (1941) Directed by John Huston. The first and best of Huston’s three great films studying human greed (the others being The Treasure of the Sierra Madre (1948) and The Man Who Would be King (1975)). Humphrey Bogart’s Sam Spade has rightfully become one of the great screen icons, tough and cynical and wisecracking, he is morally no different than the slimy Peter Lorre and the unscrupulous Sydney Greenstreet (who Lorre refers to at one point as “you bloated fool”), and you can understand how he nearly becomes the next victim of the great femme fatale Mary Astor. 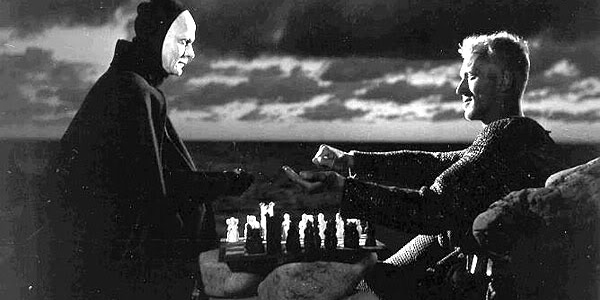 #5, The Seventh Seal (1956) Directed by Ingmar Bergman Bergman’s epic about a knight (Max Von Sydow) returning from the crusades who gets involved in a chess game with none other than Death himself. In the end, he tricks death, not to save himself, but a family of entertainers he has befriended, essentially trading his life for their lives. While unforgettable for it’s bleak and stark imagery, it also has more hope and optimism than most Bergman films. #4, La Strada (1954) Directed by Federico Fellini La Strada is something of a street fable. Fellini gives us three archeypes: The brutish Zampano (Anthony Quinn), representative of pure physicality, the clever tightrope artist The Fool (Richard Basehart), representative of the mind, or intellect, and the tragic Gelsomina (Giuletta Masin), representative of the heart, of pure emotion. The film is about the relationship of these three entities, and how each cannot survive without the others. 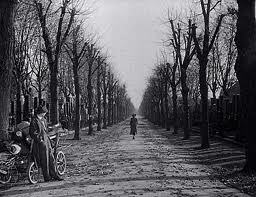 Superbly shot and directed, this is my favorite Fellini film. Much more conventional and less surreal than many of his later works, his imagery here is stunning, and remarkably disciplined. 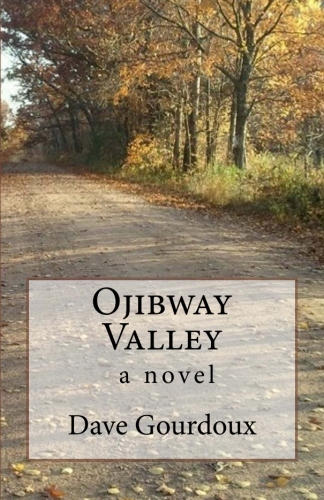 Supreme story telling, with lots to say about art and aritists, and deceptively simple. #3, Bicycle Thieves (1948) Directed by Vittorio DeSica DeSica, with films like Shoeshine, Umberto D, and Bicycle Thieves, established himself as the master of the neo-realist style. His films are visually indistinguishable from documentaries, yet no other director ever put so much heart into his work. Bicycle Thieves is the supreme tragedy of cinema, and the relationships of Father and Son has never been examined in greater depth. The ending is pure heartbreak, and will stay with you long after the credit s roll. 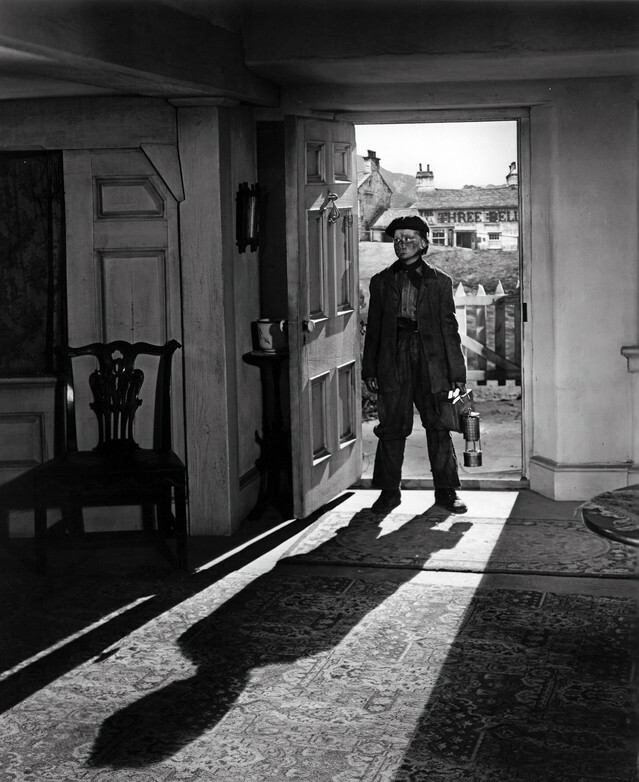 #2, How Green Was My Valley (1941) Directed by John Ford Ford’s unabashedly sentimental depiction of a small Welsh mining community, focusing on the dissolution of the family headed by Donald Crisp and told from the point of view of the youngest of his sons, played by Roddy McDowell. Ford, cinema’s greatest visual poet, fills every frame with love, and for me, he never over does it, always teetering but never going over the top. The result is one of the most beautiful films ever made, made by perhaps it’s greatest artist.